Engineering News Record, in the October 14, 2013 issue, just published its annual list of the Top 600 Specialty Contractors and Crockett Facilities Services made the list. 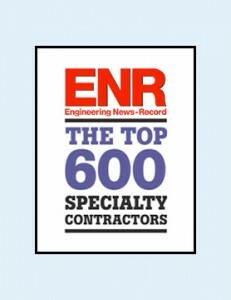 ENR, published by McGraw-Hill Companies Inc., publishes this list each year based upon annual revenues of specialty contractors across the United States. Crockett Facilities Services earned a ranking of #456. According to ENR, specialty contractors finally see signs of growth in their markets but worry politics may derail the recovery. Many specialty contractors believe the market will continue to recover over the long term, but say the recovery would be more robust if federal policies were more certain. In 2013, CFSI also was named to the Washington Business Journal’s list of top ten mechanical contractors and the top 25 women-owned businesses list, as well as the Inc. 5000 list of fastest-growing private companies in America by Inc. magazine. Crockett Facilities Services, Inc. (CFSI), a woman-owned mechanical contractor, delivers building operations and maintenance, mechanical contracting, and heating and air conditioning services to commercial and government clients. CFSI’s preventive maintenance programs, encompassing mechanical, electrical, energy management and HVAC services, help business owners, property managers, and data center /IT managers to reduce energy costs, extend equipment life, maintain tenant comfort, and decrease downtime. This entry was posted on Thursday, October 17th, 2013	at 4:55 pm	and is filed under Blog, Crockett Facilities Services Press Release . You can follow any responses to this entry through the RSS 2.0 feed. Both comments and pings are currently closed.